In the words of Nolan Bushnell, a true entrepreneur is a doer, not a dreamer. 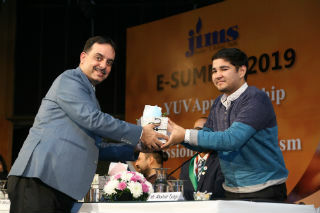 E-summit 2019 was organised by JIMS for the budding entrepreneurs- the YUVA- emphasised as to what all adventures one can experience during the journey of becoming a successful entrepreneur. 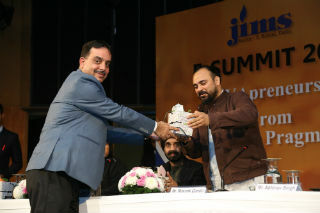 The event was organised by JIMS in association with UDGAM, Accerator Partner and Tarkash – E-Cell, JIMS, Rohini on 23 January, 2019 at the Indian Habitat Centre, Delhi. 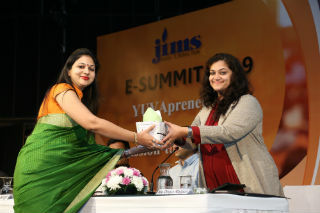 Dr. Pooja Jain, Director, JIMS welcomed the gathering and shared how important it is in today’s era to be self-reliant and achieve something for oneself. 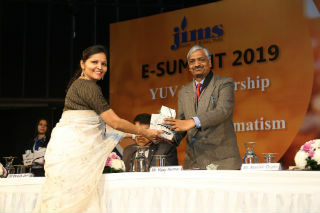 She set the ball rolling for the event and was followed by a video message shared by Shri. 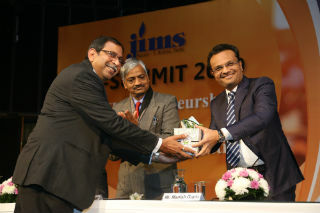 Suresh Prabhu, Hon’ble Union Minister of Commerce & Industry and Civil Aviation dedicated especially for the E-Summit organised by JIMS. The inaugral session titled ‘Understanding the E-cosystem’ saw insights shared by Mr. Vijay Kumar (Director MSME-DI, New Delhi), Dr. S. S. Acharya (GM, SIDBI) and Mr. Manish Gupta (Chairman, JIMS). 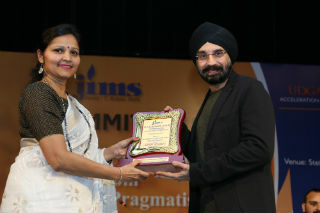 The speakers discussed about what programmes the government is currently carrying out to support and uplift the morale of the aspiring entrepreneurs and what kind of an ecosystem is being built to encourage the students not only to become the job creators but also wealth creators.The session concluded with valedictory remarks by Dr Pratima Daipuria, Dean PGDM Program and summit convener. 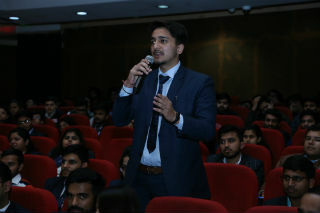 The second session of the day was themed ‘When Ideas meet Destination’. 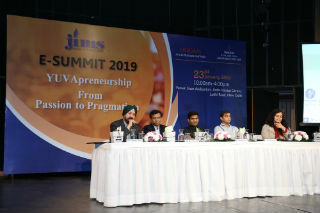 The moderator for this panel was Mr. Gagan Ghai (Venture Catalyst) and comprised of successful entrepreneurs – Mr. Amit Gupta (MD, Salmon Commerce), Mr. Dharamveer Singh Chauhan (Opoch), Mr. Jasveer Singh (Qik Rooms) and Ms. Divya Rajput (Nexus StartUp hub).The panel discussed about the sectors the entrepreneurs can venture into in next couple of years, their own success stories and the challenges they faced during their journey of becoming an influential entrepreneur. 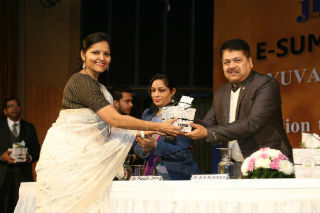 The third and the final session titled ‘E-nroute: Journey from Passion to Creation.’was moderated by Ms. Mansi Agarwal (Director, Scottish Early Years and Co-Offiz). The panel had Mr. Vineet Hukmani (MD & CEO 94.3 Radio One), Mr. Mayank Gandhi (Co-founder, Sanjhi Tokri), Mr. Abhinav Singh (CEO, Techugo) and Mr. Akshat Tyagi (Unboard) as its speakers. During the discussion the panelists shared their opinions and stories on entrepreneurship. The concept of magic v/s logic, being creative, starting as early as possible, and being a path creator than being a path breaker emerged from the discussion. 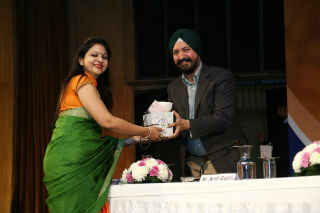 Each session ended with felicitating the guest speakers and awarding the best question asked amongst the audience. 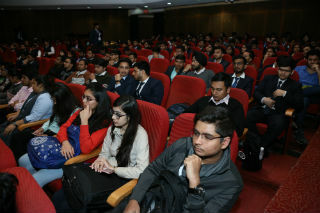 The event was concluded by Dr. Sumesh Raizada (Co-Convener) by delivering the vote of thanks for all the speakers, audience, organisers and the faculty members of the institute. 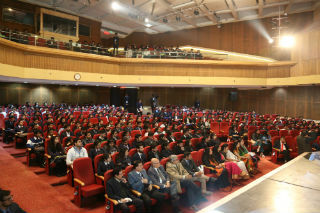 The event encouraged the aspiring entrepreneurs and gave them a glimpse of what they are likely to experience in future.